Enterprises using monolithic systems to support large applications find it increasingly difficult to respond to evolving business priorities and rising customer expectations. Every functionality is built together as one single block, and it’s almost impossible to change or update a portion of it, without overhauling the complete monolith. And that is why enterprises IT teams are rapidly exploring the advantages of microservices. Legacy systems are inflexible, hard to scale, and unable to keep pace with emerging technologies. One large code base makes it difficult to update or modify the application for a specific feature request. This leads to a greater learning curve, increases deployment cycle and project delivery timeline, slows down time-to-market and complicates delivery of new capabilities. The answer is microservice architecture. Let’s take a closer look. The microservice architecture essentially breaks down complex applications into its component functionalities, and creates each of them as independent, self-contained services. With microservices, an application is built as a suite of small services, each running in its own process and communicating with lightweight mechanisms often an HTTP resource - API. Each of these microservices focus on completing one task only (representing a small business capability) and do that task really well. 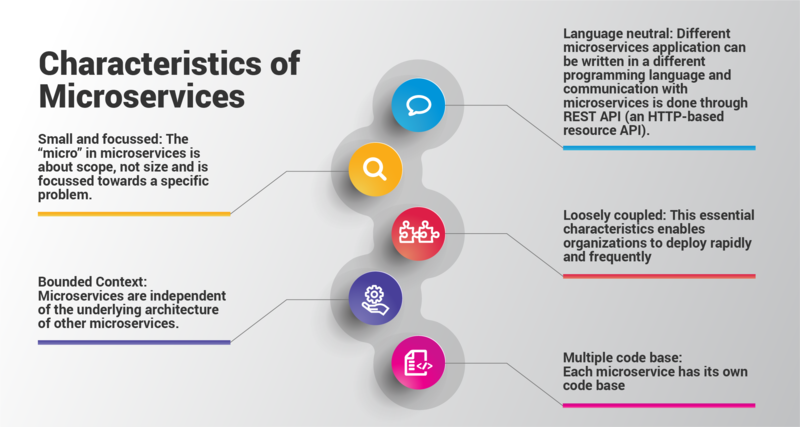 These microservices can be developed in any programming language and have a bounded context, which means that they don’t need to know anything about underlying implementation or architecture of other microservices. The microservice architecture has several advantages over a monolithic architecture, specifically focused on the code base, delivery and deployment. Enables you to scale bottle-necked services without scaling the entire application. Check out our webinar on transitioning from a monolithic to microservice architecture. Microservice architecture is helping enterprises deliver richer experiences for customers as well as employees. Responsive - Companies that adopt a microservice architecture can continuously deliver capabilities according to the customer’s changing needs. Continuous Delivery- Microservices built on the principles of Agile and DevOps help the software teams run parallel projects while iterating quickly on discrete capabilities. Scalability and Reliability - A successful microservice architecture prevents any system failure. Its repeatable automation, scaling application, and designing pattern features keep the system running. While microservices become an increasingly popular service architecture, it may not necessarily be the best fit for your project. The monolithic architecture still works better for simple, lightweight applications. However, enterprise digital transformations typically demand complex, evolving applications and for those, microservice architecture is undoubtedly a better choice. Srijan modernizes enterprise architecture with microservices & API management for faster turnaround, scalability, and resilience. Drop us a line to learn a few success stories.